NETHERLANDS: Contractor SPT Offshore has unveiled a suction-bucket offshore wind foundation design combined with a single tubular structure. The Dutch firm's design combines "three or potentially four" suction bucket foundations. The firm have yet to decide whether to use steel or concrete on supports between the foundation buckets and the tower. SPT Offshore is currently "further detailing the design" and aims to have a working demonstration "in the next 12 months", it said. 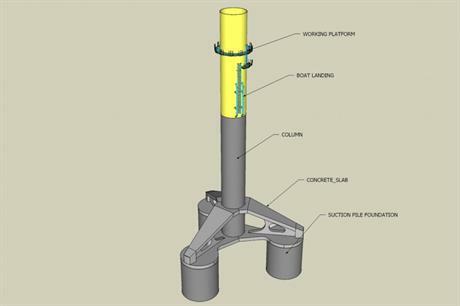 Previous suction pile designs have comprised lattice tubulars on top of the pile foundations, while SPT Offshore’s single-tube concept is believed to be the first of its kind. SPT Offshore believes the mono tubulars will be three times cheaper than jackets, while the suction piles can be installed quickly (in around three hours) and quietly without causing any shocks to the foundation or the marine environment. At the end of the turbine’s lifespan, suction piles can also be removed without leaving a trace, the offshore specialist stated. SPT Offshore has previously installed more than 500 suction piles, the company said. It has designed suction bucket foundations for five transformer substations for Dong Energy and supplied suction pile foundations for the substation at the 402MW Dudgeon project. The suction bucket foundation creates a vacuum to secure the foundation to the sea floor. Pumping air back into the bucket reverses the suction process and aids the removal of the structure.